For a free copy of the congestion bottleneck identification (CBI) Tool, please contact Joe Bared joe.bared@dot.gov, or Chris Melson Christopher.melson@dot.gov . This document is a technical summary of the Federal Highway Administration report, “Traffic Bottlenecks: Identification and Solutions” (FHWA-HRT-16-064). This TechBrief describes research on modernized congestion identification and cost-effective mitigation strategies that are not dependent on advanced vehicle technology. The research was conducted between 2013 and 2016. Traffic congestion is worsening in the United States, and the associated economic damages are increasing. States are being asked to manage their transportation problems with minimal funding. Connected and automated vehicles are expected to bring significant relief in the future, but cost-effective solutions are needed now. When transportation investments are made, it is critical to demonstrate a clear return on those investments—based on methods that are scientific and not anecdotal. A large portion of congestion is caused by bottlenecks, thus mitigation of bottlenecks is a top priority. New data sources and research ideas are giving us a new set of possible solutions. Data-driven methods facilitate a more precise quantification of congestion and bottlenecks. 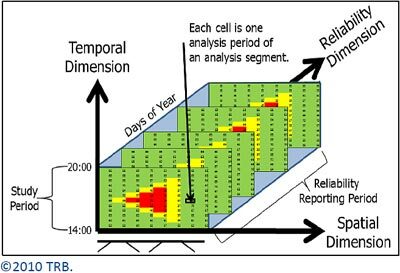 The spatiotemporal traffic state matrix (STM) shown in figure 1 is a step in the direction of ‘big data’, compared to traditional analyses. Bottlenecks can now be quantified according to D.I.V.E. – Duration, Intensity, Variability, and Extent. Researchers used the CBI tool to develop a new performance graphic called the ARM, allowing practitioners to easily observe annual bottleneck intensity and reliability within a single graphic. A new, delay-based performance measure for annual reliability called the BII was implemented within the CBI tool, for a more robust ranking of bottlenecks. Finally, a wavelet method for signalized arterials was added to the tool, to filter out delays that are unrelated to congestion. Figure 2 illustrates this easy-to-use software tool. Figure 2. Congestion and bottleneck identification (CBI) tool. This project developed a flowchart (playbook) of bottleneck classifications. Within the 7 main classifications are 70 possible solutions. The appendix of “Traffic Bottlenecks: Identification and Solutions” provides technical details on the 70 playbook solutions. The report presents additional research (e.g., microsimulations, benefit-cost analyses) on a smaller set of promising strategies. 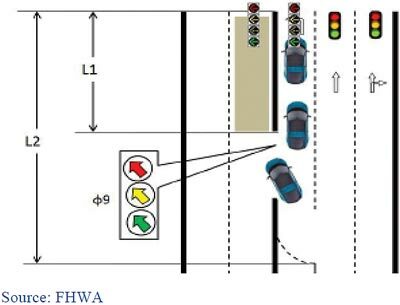 For example, dynamic lane grouping (figure 3) improves signalized intersection efficiency by adjusting the allowed movements in each lane, at certain times of day. Delay reductions up to 33 percent were observed in some cases. Similarly, dynamic merge control (figure 4) improves freeway merge efficiency by closing the rightmost mainline lane at certain times of day. 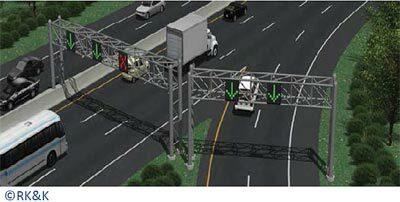 This allows easy merging from the secondary roadway, and eliminates most weaving delays. Figure 3. Dynamic lane grouping at a traffic signal. Hard shoulder running (figure 5) and lane narrowing (figure 6) provide additional travel lanes without widening the freeway. Real world implementations have exhibited significant capacity increases with minimal safety impacts. In fact, some researchers are proposing increasingly dynamic forms of hard shoulder running and lane narrowing, which may yield significant benefits in the future. Figure 5. Hard shoulder running on a freeway. Figure 6. Lane narrowing to add a new lane. 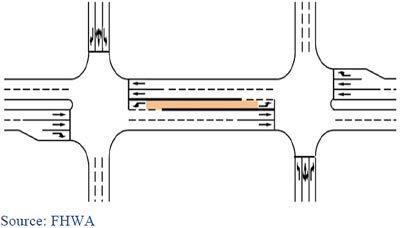 At signalized intersections and diamond interchanges, contraflow left turns (CLT) can dramatically reduce delays by reversing directions during each cycle. CLT pockets (figure 7) have been implemented in over 50 sites in China. CLT lanes at interchanges (figure 8) have reduced delays by up to 80 percent in microsimulation models. Human factors studies are now evaluating various signing options, to enable safe implementation in the United States. Figure 7. Contraflow left-turn pocket at a traffic signal. Figure 8. Contraflow left-turn lane at a diamond interchange. 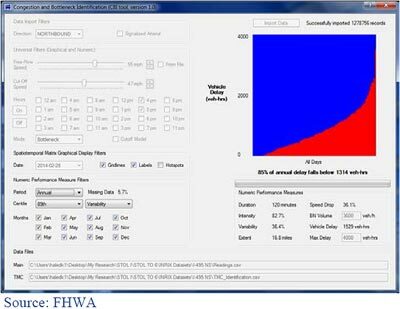 An easily accessible tool is now available to visualize and analyze congestion and bottlenecks using INRIX data. Several effective treatments to mitigate bottlenecks have been analyzed. This project produced a new method for ranking traffic bottlenecks, a new playbook of 70 bottleneck mitigation strategies (contained in the report “Traffic Bottlenecks: Identification and Solutions”), and a benefit-cost analysis of 4 low-cost freeway bottleneck mitigation strategies (dynamic merge control, hard shoulder running, acceleration lane extension, and narrow lanes). In addition, three effective treatments to mitigate bottlenecks at signalized intersections were analyzed. Notable among them is the CLT treatment for signalized intersections and diamond interchanges that can reduce delays and increase throughput significantly by reversing directions within each cycle. As a result of these innovative treatments, several future studies are recommended: (1) to determine the best way to design the contraflow left turn lane application, and to recommend best signing and marking; (2) to expand analysis of multiple scenarios for the CLT treatment; and (3) to develop analysis methodologies for narrow lanes in the “Highway Capacity Manual” and in traffic simulation. Transportation Research Board. (2010). Highway Capacity Manual, Fifth Edition, Transportation Research Board, Washington, DC. Obtained from: hcm.trb.org. Site last accessed August 4, 2016. Iteris. (2014). 2013 Most Congested Freeways Report and Methodology, Metropolitan Transportation Commission, San Francisco, CA. Schneider Electric and RK&K. (2015). 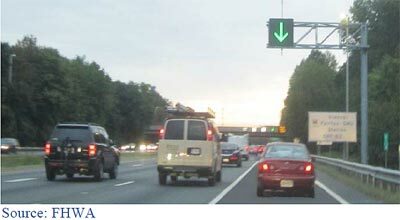 Bryan Park Interchange Dynamic Lane Merge Assessment, Contract Number 40903, Task Order 17, Virginia Department of Transportation, Richmond, VA.
Researchers—This study was performed by Leidos, Inc., Contract No. DTFH61-12-D-00020. The study authors are: David Hale, Ramanujan Jagannathan, Michalis Xyntarakis, Peng Su, Ximiao Jiang, Jiaqi Ma, Jia Hu, and Cory Krause. The FHWA Contracting Office Representative is Joe Bared (202–493–3314, joe.bared@dot.gov). Availability—The publication associated with this TechBrief is “Traffic Bottlenecks: Identification and Solutions”, Report No. FHWA-HRT-16-064. It is available in print for specific distribution, and online at https://www.fhwa.dot.gov/research. Keywords— Research, Traffic bottlenecks, Dynamic lane use, and Traffic simulation. Keywords: research, operations, intelligent transportation systems, ITS, Research, Traffic bottlenecks, Dynamic lane use, and Traffic simulation.